On September 7, 2011, Abdulkarim Arabab Lazim, with his two small children by his side – Abdulmunim (7) and Selima (5) – arrived at Chicago O’Hare Airport, exhausted after a long journey from Kenya. Their arduous journey originates in El Geneina, a village on the western edge of the Darfur region in The Sudan. One evening, their village was brutally attacked and Abdulkarim – with his wife, son, and some elders – were forced to flee for their lives. They ran toward Nyala; only travelling through the bush during the cover of night. It took several months to complete their journey by foot. After being told that Nyala was no longer safe either, the family began walking once again. This time they headed toward Kosti, a distance nearly twice as long as their first sojourn. After ten days of walking, a passing truck approached them along the road. At first, the small, frightened group believed the truck’s occupants to be dangerous, and were prepared to run for their lives again. Fortunately though, they were told they only wanted to help them; and they drove them the rest of the way to Kosti. They left Kosti after a short time, when they heard that Non-Governmental Organizations (NGO’s) had established bases in Kadugli, near the Nuba Mountains. For Abdulkarim and his family, Kadugli symbolized a place for food, shelter and safety. 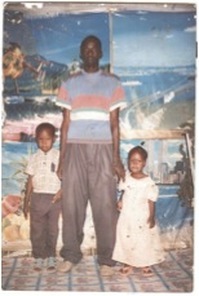 Their daughter, Selima was born in Kadugli. In 2007, a few years after their arrival in Kadugli, an NGO worker told them that they, along with three other families, were chosen to be moved to a refugee camp in Kenya, called Kakuma. At the Kakuma refugee camp in northwestern Kenya, Abdulkarim’s wife, pregnant with their 3rd child, was diagnosed with malaria. Although severely ill and hospitalized, she found the strength to give birth to a baby boy. Unfortunately, soon after their second son was born, Abdulkarim’s wife passed away. For some time thereafter, Abdulkarim walked an hour’s distance to get milk to feed his baby boy. In spite of this persistence, after five months, the baby died. Abdulkarim pleaded to be taken anywhere else. But he was eventually convinced to remain at Kakuma. The United Nations High Commissioner for Refugees (UNHCR) then moved him and his children to a section of the camp specifically for widowed fathers. One day a list went up inside the camp listing the names of people who were approved for resettlement in the United States. Abdulkarim and his children’s names were on the list. After completing the lengthy interview process, he was told that he would be going to Chicago. Although he was afraid of being the only family out of the entire group to be resettled in Chicago, he was comforted by the knowledge that he would be going to the place of Barack Obama’s home. Abdulkarim is beyond grateful for the opportunity he has to begin a new life all over again. He is excited to learn, and his enthusiasm serves to inspire us at RefugeeOne. Abdulkarim is committed to working hard, so he can be a role model for his children; like any good father. He is patiently waiting for the day that he can tell his children about their lives in The Sudan and all the struggles they have been through. He hopes that they will achieve more than he can even imagine.